Today’s post was written by Sandi Adams, technology project specialist for Cherokee County District. Fall is my favorite time of year to get outdoors and spend some time hiking and backpacking. No matter if it is a day trip or overnight, I always pack my little Swiss Army Knife—my one tool with so many uses. This time of year also involves my favorite education tool—OneNote. Like my Swiss Army Knife, OneNote is the one tool with many uses. A virtual notebook reminiscent of my old Trapper Keeper, OneNote organizes by sections or group sections with unlimited pages packed with documents, photos, emails, spreadsheets, recordings, inking and so much more. It gives me the ability to collaborate with colleagues and students, and best of all, I can access the most current version of my notebooks from my phone, iPad, Microsoft Surface, desktop or laptop. I start each year with a personal school notebook. This includes group sections for each school I service, with sections for logistics, schedules, training materials and communication. I have sections for conferences, special projects, staff meetings, instructions and MIEE. My notebook is synced to my iPad, phone, desktop and laptop, giving me quick access to everything related to my job. Each member of the technology department has access to everything we need in our staff services notebook, including school floor plans, project workflows, organizational charts, resolutions to issues, personnel forms, project management and evaluation information. In addition, all changes occur in real time. Our lead teachers create a notebook for their team, allowing for collaboration of lesson plans, storing parent communications and organizing events that take place throughout the year. Having the ability to access all of this information in one place has proved to be an invaluable tool for the teams. The Leader Keys Effectiveness System (LKES) is an evaluation system that allows the state to ensure consistency and comparability across districts, based on a common definition of leader effectiveness. Our leadership evaluation documentation has gone from spiral-bound paper copies to OneNote. Our principals share their notebooks with the superintendent’s office, providing a record with meaningful feedback supporting the continuous growth and development of each school leader by monitoring, analyzing and applying pertinent data from multiple sources toward attainment of established performance goals. Every school has a handbook with all of the information for the school year, from discipline to leave information and everything in between. The OneNote Staff Notebook proved to be the perfect match for this task. The principals created notebooks sharing admin rights with the assistant principals, including all school data in the content section. Being able to update in real time to all staff members makes it the perfect tool. The Collaboration section is used for various meetings, leadership, technology, hospitality and staff meetings, which gives attendees the ability to contribute to the recording. This section is also a great way for principals to quickly gather information from the staff. Teachers upload their lesson plans, communication tools and professional development records. This process keeps all of the information in one spot, making it a professional and easy medium for the evaluation, with administration always having access. 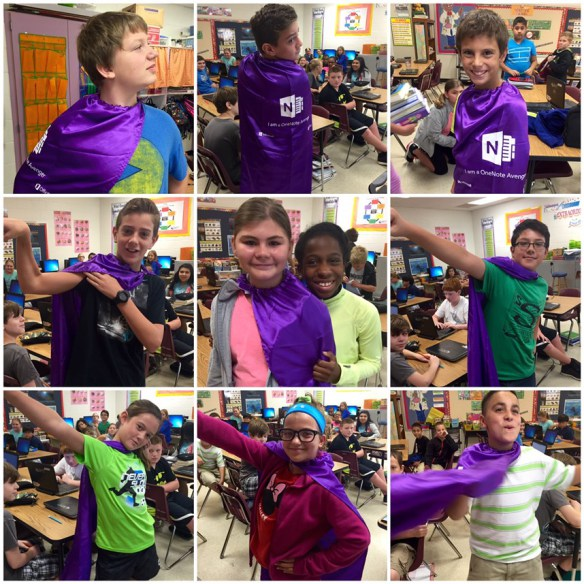 Many of our teachers create notebooks using the OneNote Class Notebook for our students from 4th to 12th grade. The Content area provides the perfect place for subject textbook information, assignments and resources. Collaboration content can include a yearbook space for each student, essential question of the day or a discussion space for a class topic. Each student has a private space to turn in assignments and homework and journal. Grading papers from one location makes this seamless for class management. Additional uses for OneNote include notebooks for our Professional Development classes, Innovation Zones, EdCamp, the Office 365 Swat Team and lesson plans. For more information on OneNote, check out OneNote for Teachers and OneNote.